Located at a distance of 56kms from Pollachi, Anaimalai (Elephant Hills) is a wonderful hill station in Tamilnadu along the border of Kerala. Situated at a height of 265 meters altitude above the sea level, it is in the Coimbatore district. 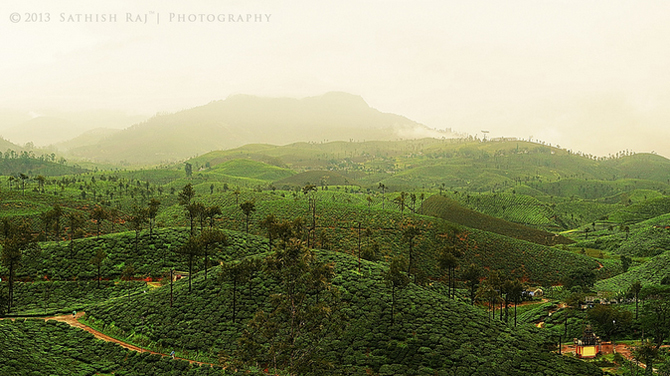 The lush green hills and the varied flora and fauna attracts hundreds of tourists to Anaimalai each year. Annamalai derives its name ('Anai' meaning elephant and 'Malai' meaning hills) from the large number of wild elephants living in the area. Indira Gandhi Wildlife Sanctuary and National Park, Eravikulam National Park, Chinnar Wildlife Sanctuary and Parambikulam Wildlife Sanctuary all which are a part of the Annamalai Hills are well known for elephants. The hills is a part of the Western Ghat ranges and if one goes further down, 'Anamudi' (8842 feet.) the highest peak in India can seen. A souce of several rivers and many large dams, Anaimalai boasts Sholyar dam, one of the biggest in Asia and Parambikulam dam one of the largest water carrying capacity in India . It is also a popular destination for temples and Annamalai Temple is one among them. The hills are therefore also referred to as 'holy hills' in Thiruvannamalai. Other popular names of Annamalai Hils in the south are Arunagiri, Arunai, Arunachalam, Sonagiri and Sonachalam. Annamalai Hills is the ideal place for first-time trekking. There are several points that have been set here and trekkers undertake their journeys to these points. One can follow different trekking routes from simple to difficult. Some of the simple treks are Pandaravara a 8 km trek and Kozhikamuthu, a 12 km trek. These places are merely easy to trek whereas the difficult places of trekking include the Perunkundru, which is 32 km. To start trek, one will need to seek prior permission from the Range authorities at the Topslip. There are neighboring hills too that are extremely popular. This is also a place for many Hindu and Jain temples. It is also known as one of the eight sanctified Jaina hills. It is a picturesque locale in the Anaimalai Hills. It has a small park and the medicinal plant conservation area. It is about 37 kms from Pollachi. An ideal picnic spot, it's name comes from the 19th century practice of sliding teak logs down the Anamalai Hills. An ideal place for bird watching, Safari trips are operated by the forest department between 8 am and 5pm which lasts for about 90 minutes and it charges Rs. 40/- per person. Private vehicles are not allowed for the safaris. One can go on a trek inside the park for a maximum of 4 hours with an official guide and the rate is Rs. 70/-. Booking can be done at the reception center of the park. Varagaliar Elephant Camp is situated right of the main Anamalai forest. There are around 21 domesticated elephants. These elephants provide proper assistance during the conflicts between man and elephant in the nearby Valparai Plateau. Special permission is needed to see this camp from the Deputy Conservator of Forests Pollachi. Contact : Ph: 04259-225356. The Indira Gandhi National Park and Sanctuary formerly known as the Anamalai Wildlife Sanctuary lies in the Coimbatore District of Tamil Nadu at the southern part of the Nilgiri Biosphere Reserve in the Anamalai Hills. Named after the late Prime Minister Smt Indira Gandhi, it is an ecological paradise covering an area of 958 sq.kms. The wildlife sanctuary includes a National Park also. It was notified as a sanctuary in the year 1974 and 108 sq.kms of its unique habitats at 3 places - Karian Shola, Grass hills, Manjampatty were notified as National Parks in 1989. The Sanctuary declared as a Tiger Reserve in April 2008. The sanctuary is the home to various kinds of wild life animals. Other attractions here are the grass hills, karianshola, anaikunthi shola, groves, waterfalls, teak forests, reservoirs and dams. The Forest Department organises elephant safaris and jeep rides into the sanctuary. The sanctuary is opened from 6.30am to 6.30pm and December to February is the ideal time to visit this place. The park is daily open from morning till evening hours. Sprawling over an area of about 285sq.km, Parambikulam Tiger Reserve attract tourists to enjoy beauty of nature. The sanctuary was established in 1985 with an area of 285sq.km. Previously it was known as Parambikulam Wildlife Sanctuary and it became the 38th Tiger Reserve and second of Kerala in 2010 February 19. The reserve contains around 20 Tigers, 51 species of Reptiles, 204 species of birds, 160 varieties of butterflies and other species. Parambikulam Tiger Reserve is rich in bird life, is noteworthy for its rich tropical rain and teak forest. Besides its rich flora and fauna the sanctuary contains three dams, and the dammed waters are home to a variety of endangered species such as crocodiles, otter, turtles etc. The visitors can also avail and enjoy the boating facilities provided at the dams.